A car that maintains its market and quality for 60 years is something to admire. Mercedes-Benz, in celebration of the 60th anniversary of the S-Class Coupe, is launching the CL-Class Grand Edition which features, elegant paintwork, leatherwork and tires. In order to emphasise further the exclusive, hand-finished character of the CL-Class, Mercedes-Benz has furnished the “Grand Edition” with some of the finest ingredients from the exquisite designo range. Customers can choose between the three designo paint finishes of platinum black metallic, mocha black metallic and the currently very voguish matt finish of magno cashmere white. A sporty note is added to the car’s look by the AMG Sports package, with powerful front and rear aprons and distinctive side sill panels. Also included here are 20-inch light-alloy wheels in a choice of five-spoke or filigree 10-spoke designs. A “Grand Edition” badge provides a discreet indication of the CL Coupé’s exclusive-edition status. Mercedes-Benz is marking the anniversary of “60 years of the S-Class Coupé” with a new “Grand Edition” model. The features of the CL?Class “Grand Edition” include exclusive designo paintwork, high-quality designo leather appointments and sportily elegant 20-inch wheels. AMG bodystyling elements add a distinctive touch of sportiness, while a special badge indicates the exclusive nature of this anniversary edition of the luxury coupé. The launch of the sensational 300 S in 1952 established the lineage of today’s CL-Class. The large S-Class Coupés from Stuttgart have been considered the epitome of automotive refinement ever since. These two-door luxury-class coupés combine the comfort of a prestige luxury saloon with the dynamics of a sports car in the form of an exceptionally elegant tourer. They offer stunning design, exclusive appointments and top-flight technology. For its new “Grand Edition” special edition model, Mercedes-Benz has further honed the sophisticated and unmistakable style of this design icon, adding further to its cachet and maintaining the brand’s leadership status in the luxury car segment. In the interior, exquisitely handcrafted, high-quality aniline leather serves to underline the luxurious nature of the “Grand Edition”. Three stunning and tasteful leather colours are available to choose from for the interior appointments: designo aniline leather armagnac, designo aniline leather deep black and the lighter designo aniline leather porcelain. The full range of CL trim finishes is available, including black ash and high-gloss burr walnut. As with all CL models, the CL “Grand Edition” is also exceptional in technical terms. The active suspension system Active Body Control (ABC) with crosswind stabilisation, for example, sets the benchmark for driving dynamics and comfort on all rear-wheel drive CL models. Safety systems such as the drowsiness detection system ATTENTION ASSIST, PRE-SAFE® automatic emergency braking and the optional Active Blind Spot Assist, Active Lane Keeping Assist, and Adaptive Highbeam Assist systems, ensure that the CL takes pole position in the luxury coupé segment. And the same is true of the engine range: the current V8 biturbo with a displacement of 4.6 litres and sophisticated spray-guided direct petrol injection system in the CL 500 BlueEFFICIENCY delivers 320 kW (435 hp), provides torque of 700 newton metres and opens up a whole new dimension of efficiency in the luxury coupé segment (9.5 l/100 km combined; 224 g/km CO2). 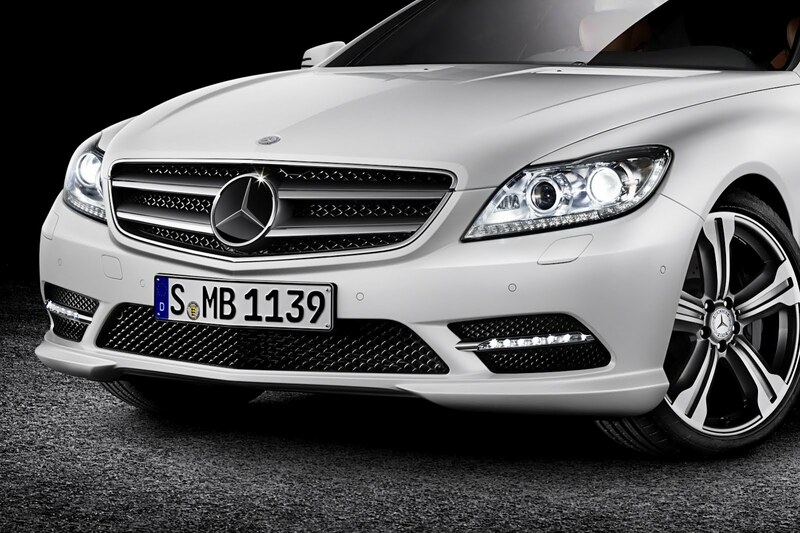 The same engine is also used in the CL 500 BlueEFFICIENCY with 4MATIC all-wheel drive. The pinnacle of the engine range is provided by the CL 600 with its 380 kW (517 hp) 12-cylinder biturbo (displacement: 5.5 litres). Irrespective of which base model is chosen, the CL “Grand Edition” is available for a package price of 4850 euros (excl. VAT). This represents a benefit to the customer of up to 38 percent. The complex designo magno paintwork is priced at an additional 1500 euros.